The file extension .csv stands for “comma separated value.” CSV files are long text lists of numbers where each data entry is separated by a comma (,). SkyServer’s Online Notebook and SQL Search tool both allow you to save your search results as .csv files.Opening a .csv file is similar to opening a normal Excel file. Click the Open File button (or select Open from the File menu). You will probably not see the file listed. Click on the “Files of type” bar and select Text Files. 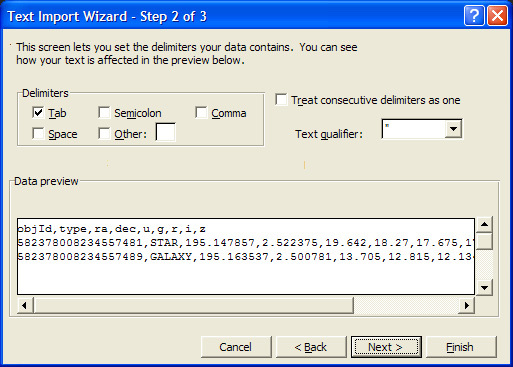 You should now see your .csv file listed, and you should be able to open it by double-clicking on the file. However, if your file contains SDSS Object IDs (as it will if you saved it from SkyServer’s online notebook), then opening the .csv file the normal way will cause the last three digits of the object ID to be cut off. 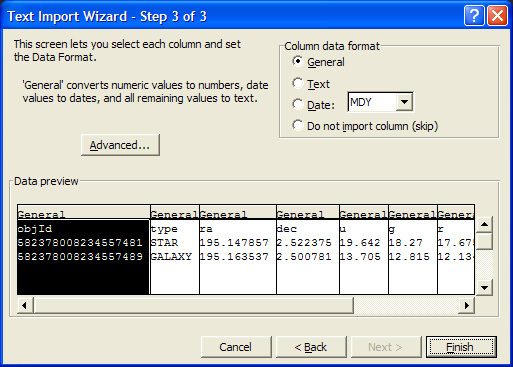 To open the object IDs correctly, use Excel’s “Import Text File” wizard. 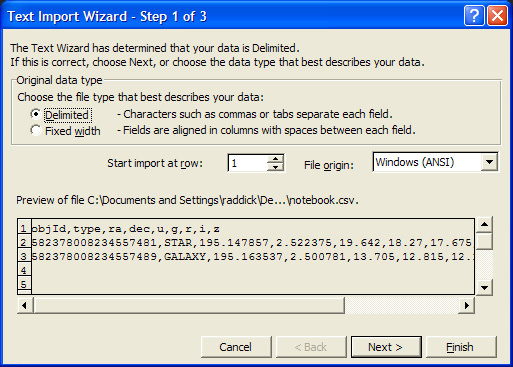 This step allows you to declare what types of data you have. Click on the column that contains the object IDs, then click “Text.” Excel will now read that column as a text string rather than a number. Leave the rest of the columns as “General.” Click “Finish.” Select where you want to paste the data, then click OK. You should now see your data, with the object IDs complete.